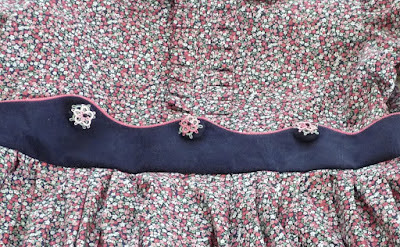 Some weeks ago, while attempting to sew a perfect French Seam for the floral dress in this post, I remembered that I learned a pretty nifty technique from Lyn Weeks in the Frannie class I took from her a couple of years ago. Of course, all my notes are in storage awaiting construction of our new home in Colorado, so I searched online and found a tutorial of this very technique by Southern Matriarch. 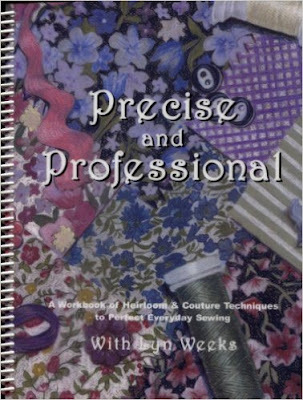 Since Martha mentions in the tute that it is from Lyn's book Precise and Professional, and I knew it to be out of print, I decided to take a gander on eBay to see if I could find it. Well, believe it or not I found it. Only $14.00 plus shipping (almost as much as the book), but now I have it! It arrived within 4 days, perfectly wrapped and is brand new, not used. 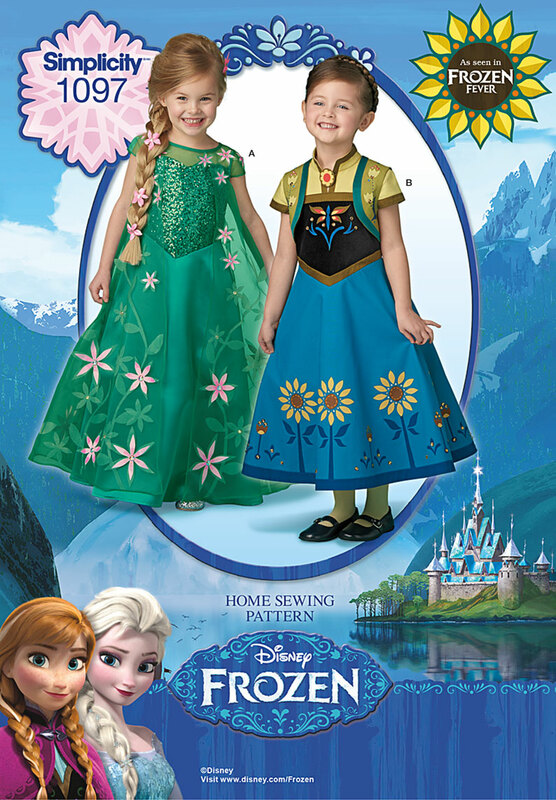 It has all of the standard heirloom sewing techniques, such as attaching entredeux to fabric, also to laces, around corners, etc. The tuck section is almost 20 pages in itself, covering pin tucks, release tucks, hem tucks, twin needle tucks, you name it. And of course, the French Seam tutorial I was searching for. The illustrations are all very clear as are the directions for each technique. If you can find a copy of this book, I heartily recommend it. 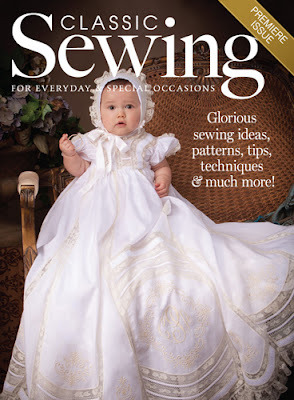 As I mentioned, the book is out of print, but Lyn has said she may publish some smaller texts about heirloom sewing. Her blog hasn't been updated in a while so I don't know the status of the project. 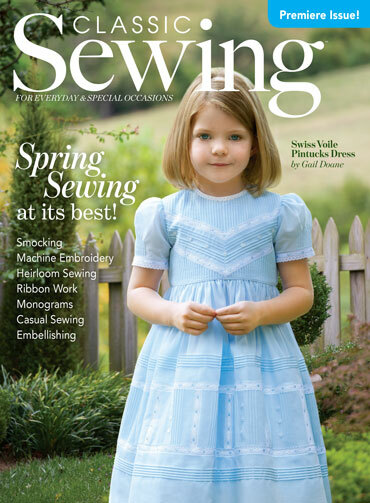 So I encourage all of you who are interested in heirloom sewing to email Lyn and ask her the status of her new books. Here in Northern Colorado there aren't many SAGA chapters to join, in fact, I have to drive two hours to just south of Denver to attend a meeting. So I've joined two EGA chapters here, Centennial Chapter in Greeley and Rocky Mountain Chapter in Ft Collins. I was reading the Regional Newsletter back in August when I saw that the Turquoise Trail Chapter in Albuquerque was having Marian Scoular in for three classes over Labor Day weekend. I've taken a couple of classes with Marian over the years, and I jumped at the chance to take another, Richelieu Embroidered Tea Towels. 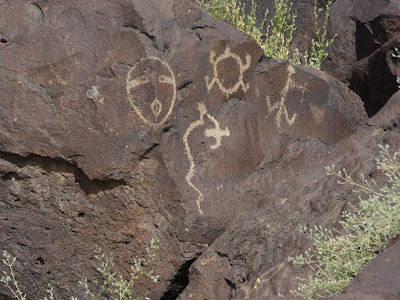 So we drove down a day early, and spent some time looking at the petroglyphs, basically ancient graffiti by Indians and Spanish travelers. 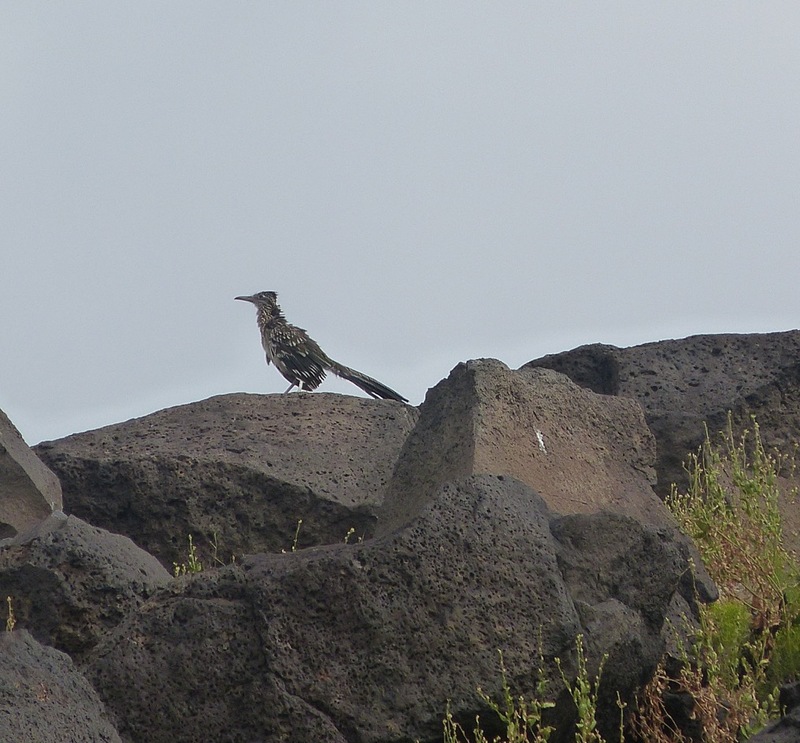 And of course, I couldn't leave out this guy, a real road runner! They are really neat birds. They will eat snakes, and since they often can't get a whole snake down in one go, they will run around for several days with a piece of snake hanging out of their mouths, digesting it over time until it's all gone. That's a tough bird. We used to see them on and off in Southern California. 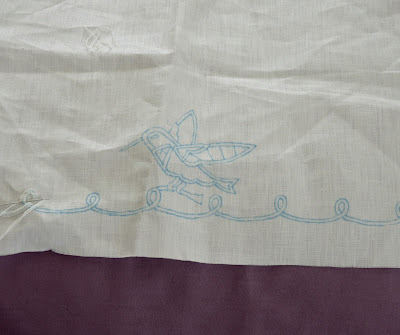 Marian drew the design onto the tea towels, so we were able to get right into stitching. 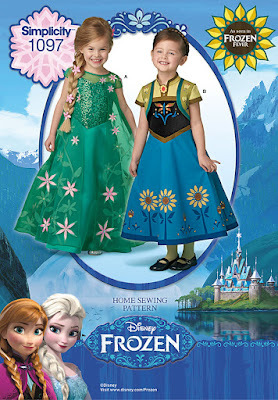 The embroidery is done in blanket stitch, with bars floating in the flower center and one of the leaves. 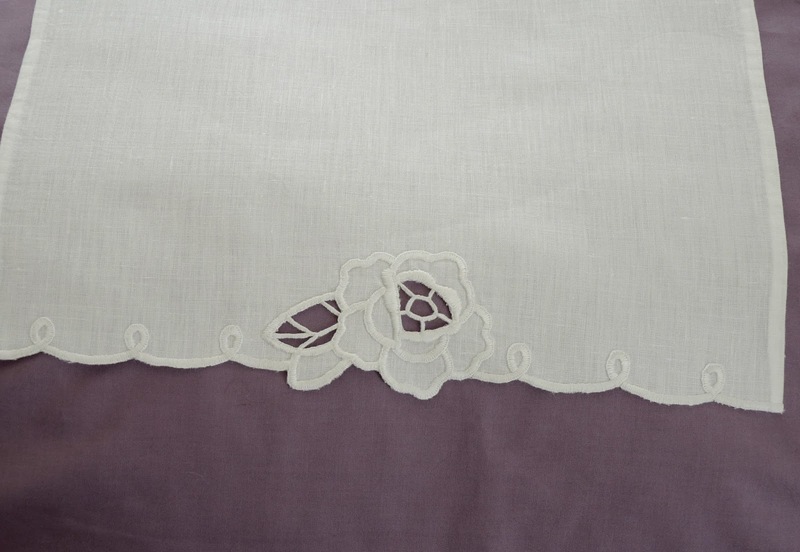 We had the loveliest Ulster linen and embroidered the design with DMC floche, one of the nicest threads for embroidery. This is the towel before cutting and washing. 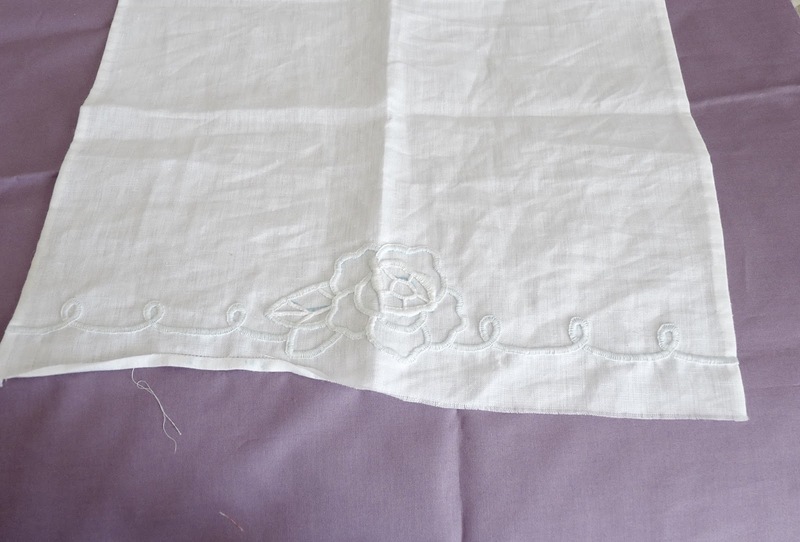 You can see how crumpled the linen gets. The folded area on the bottom right was my trying out Point de Paris for the side hems. I decided to go with just a simple blind hem. Our kit contained size 140 sewing thread, which is much too delicate for Point de Paris, as it kept breaking and driving me nuts. I was fairly nervous about cutting the fabric, after all the work I had put into it. But the duckbill appliqué scissors make this a breeze! I got these a few years ago as a Christmas gift and they are just what's needed for appliqué. You can get them at Joann's. Finished towel, washed, ironed, and with all the little thread ends trimmed. The circle in the rose was a new technique. 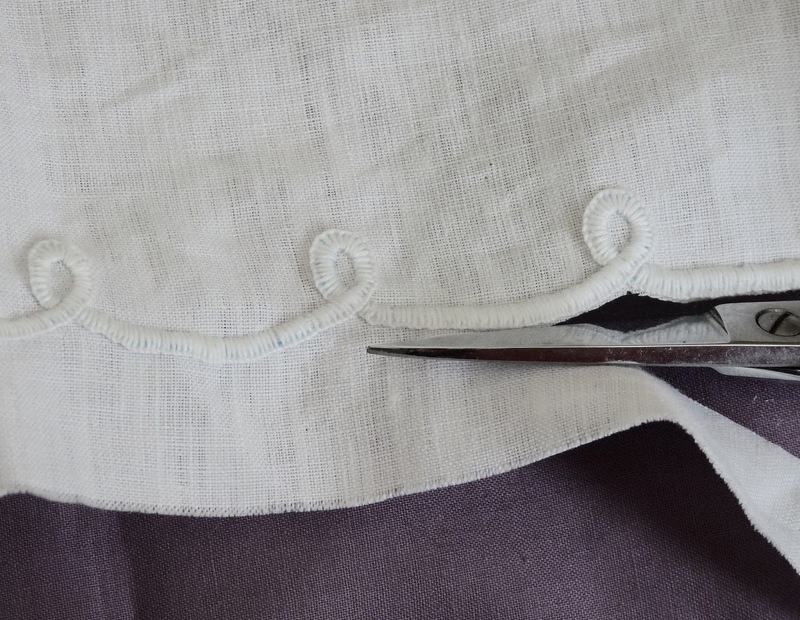 We were instructed to wind the floche around a finger a few times, then work the blanket stitch on the ring. I ended up using a marking to get the right size, and it only took two tries to get it right. It's a bit hard to see here, but I padded the blanket stitching right around the center of the rose, to give it a bit of dimension. As usual, I ordered a companion piece, a darling hummingbird. I'll probably do a bit of padding on the wings. Then when I got home, I ordered two more linen pieces for towels and the few colors of floche that I didn't already have. I can't wait to hang these in my new house. 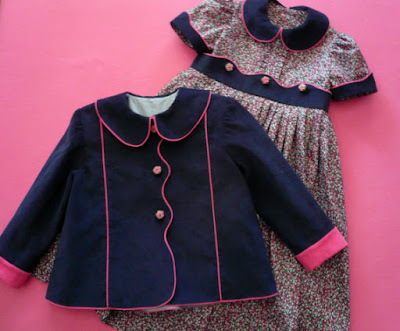 My latest project is this beautiful Dress and Jacket combination from Gail Doane (her picture, by the way, not mine). 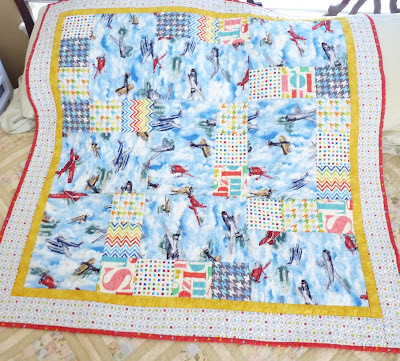 If you have ever taken a class from Gail, you will recognize her exquisite workmanship, attention to detail, and beautiful color combinations. This is bright, but not overly so. I'm not a fan of the current trend of loud clashing prints on little girls clothes, so this one is just right. If you click on this link, it will take you to her Etsy shop so you can see all of her other beautiful kits. So, after washing, drying and ironing all the fabrics, my first task is to make nine yards of pink piping. This tumble of bias strip is made with a lovely pink corduroy included with the kit. I went out and bought a clear mini piping foot for my machine just for this project. Well, I did have it on a list to buy for some time now. I had been using my buttonhole foot, which has a channel under it for piping, but the channel is fairly large and the foot was hard to use, being metal. This clear foot has a smaller channel, perfect for mini piping, and works beautifully. It also helps to stitch very slowly. 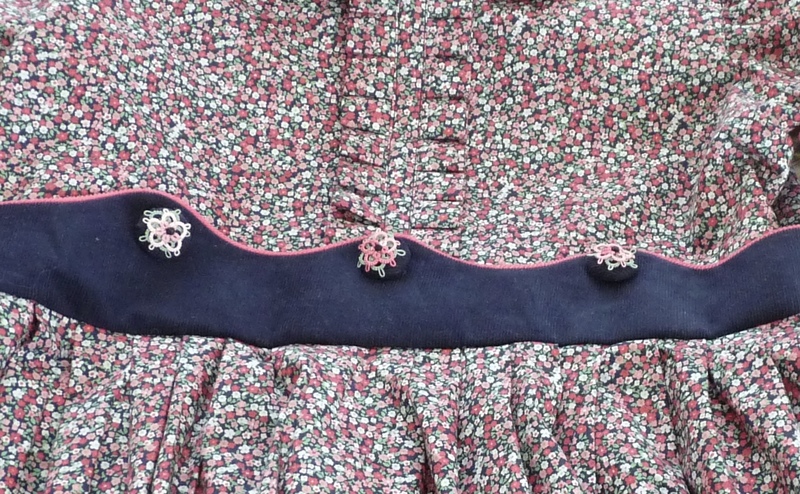 The bodice of the dress has pleats, not ruffles, so I made the pleats with a 1/2 inch quick pleater that I picked up at the SAGA retreat in Valley Forge (more on that in another post). I can't get over how well this worked. You just insert the little fork, turn and stitch. Perfect pleats every time. 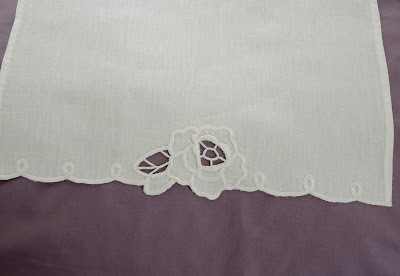 A sample of the pleated fabric. Finished pleats sewn to the bodice front. 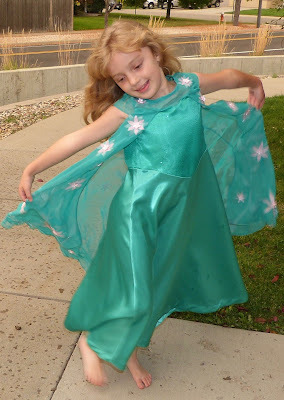 The instructions call for making a strip, folding the fabric right sides together, pleating with the folded side out, then sewing to the bodice front with the raw edges right on the center. Then I made another strip and sewed it to the other side of the bodice front butting the raw edges to the strip already sewn on. Then I made another strip, folded so the raw edges met in the middle in the back, and topstitched it to cover the raw edges of the pleats. There has to be an easier way to do this, so maybe I'll experiment a bit once I'm through with the dress. 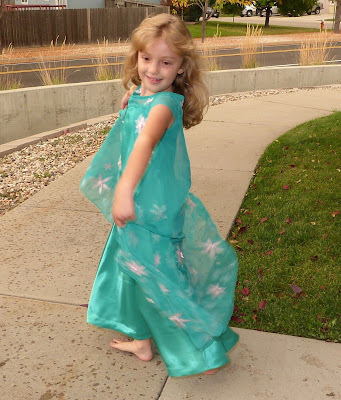 The dress is pretty much completed now, but there is a storm coming in and the lighting isn't so good right now, so no picture. I forgot to take pictures of the collar construction, but I will for the jacket. It's fairly easy to get right and works beautifully. It's definitely a technique worth mastering. Since I've been in Colorado, I've tried making cookies for my granddaughter with limited success. They all seem to turn out very flat. This is probably due to the high altitude (about 5,000 ft, 1,524 m), so I'll have to do some research on this. Does anyone out there have this problem?